I read this article and found it very interesting, thought it might be something for you. 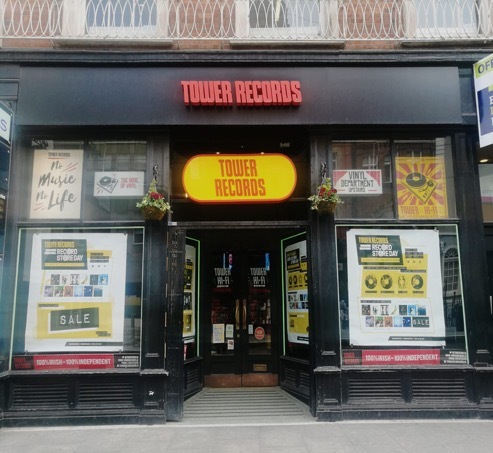 The article is called Tower Records Dublin Presents Record Store Day Sat 13th April 2019 and is located at https://www.totallydublin.ie/music/tower-records-dublin-presents-record-store-day-sat-13th-april-2019/. Record Store Day is back for its 12th year, with hundreds of exclusive limited releases only available on the day!!! Limited edition vinyl from artists such as Pearl Jam, Idles, Leftfield, Captain Beefheart, Sigur Ros, David Bowie, U2, Queen, Monty Python’s Life of Brian (on picture disc) and many more, all instantly collectable records, this will be the best Record Store Day Ever!!! In the run-up to the biggest day of the year for vinyl lovers old and young we will have some of the best Irish bands launching their albums with us with exclusive in-store performances. Fontaines D.C. will be bringing their blistering live set to our Dawson Street store on Tuesday evening 9th April to celebrate the launch of their much anticipated debut album ‘Dogrel’. Pre-order the album in-store or online from us to be in with a chance to attend. On Thursday evening 11th April, we will have Walking On Cars launching their new album ‘Colours’, before they embark on a nationwide tour. To be in with a chance to attend the launch pre-order their new album in store or online from us. All Tvvins play the following day at midday (Friday 12th April). They will be performing tracks from their second album ‘Just To Exist’, coinciding with the album’s release. As usual, we will also be running our enormous annual Vinyl Sale until Easter weekend and there really is something for everyone. Classic albums from Nirvana, Velvet Underground, Weezer, Eels, Amy Winehouse, John Coltrane, Madonna, Van Morrison, The Ramones and hundreds more titles, all available at unbelievably low prices. Saturday 13th April is the big day itself and Tower Records will be open from 8am in both O’Connell St & Dawson St. The line starts to form in the early hours of the morning so join the queue early to avoid disappointment. We will be handing out free tea/coffee and something to dunk so that your fingers won’t get too cold for flicking through the vast amount of records we will have on the day. Tower Hi-fi store in Dawson Street will have a limited supply of the 2019 Rega Record Store Day limited edition turntable available for sale on the day. We will also be running competitions for some great prizes for our customers throughout the day with many more still to be announced. Follow us on social media to stay up to date with all further announcements and join us on the day. PLEASE NOTE ALL RSD exclusive releases will only be available to purchase in our stores. These exclusive items will not be available to purchase online until one week after the event, Saturday 20th April.